Debate and vote on allowing non-tenured regular faculty from three schools to serve on the senate will take place in January. A resolution to amend the Faculty Organization Plan to authorize non-tenured regular faculty from three schools to serve in the Faculty Senate was discussed at Friday’s meeting, led by President Steven Knapp. The School of Medicine and Health Sciences, the School of Nursing and the Milken Institute School of Public Health were identified as the three schools that could be provided with an exemption to the Faculty Organization Plan, which currently allows only full-time, tenured faculty to serve in the senate. A significant portion of faculty at the three schools are non-tenure track faculty. Formal debate and a vote on the topic will take place at the Jan. 15 senate meeting. A resolution to amend the Faculty Organization Plan to allow non-tenured faculty throughout GW to serve on the Faculty Senate failed to get the two-thirds majority vote required to pass at the university’s annual Faculty Assembly in November. Friday’s discussion was about applying the criteria of that resolution to three schools with different faculty representation than the rest of the university. The differences are inherent to the schools, Mr. Wilmarth said. For example, SMHS and the SON have an intensive clinical component, which requires very low student-faculty ratios. It isn’t practical or feasible for the university to tenure many of those faculty members, Mr. Wilmarth said. The Board of Trustees in June approved amendments to the Faculty Code that included an amendment to exempt the three schools from provisions requiring that at least 75 percent of the regular faculty must hold tenured or tenure-track appointments and at least 50 percent of the regular faculty must hold tenured or tenure-track appointments. Elliott School of International Affairs Dean Reuben E. Brigety II was introduced as a new member of the senate. Dr. Brigety joined GW in October. Joseph Cordes, acting chair of the Fiscal Planning and Budgeting Committee, provided a report on the university budget. Dr. Knapp delivered a message to the GW university community last week regarding long-term budget challenges. George Washington Today published a FAQ on the budget as well. The presentation covered steps the university took in April to reduce expenditures, primarily in units in the central administration, as well as the long-term approach Dr. Knapp outlined in his message last week. Sara Rosenbaum, co-chair of the Benefits Task Force, presented the group’s long-term report. The 27-page document, which can be viewed in its entirety online, was released earlier this month at an event attended by more than 100 university faculty and staff. In his remarks, Dr. Knapp highlighted several campus initiatives from the fall semester, including his recent participation in a conversation on campus race relations at Howard University, GW’s recent creation of the District Scholars Award and a partnership with the Posse Foundation announced in October. 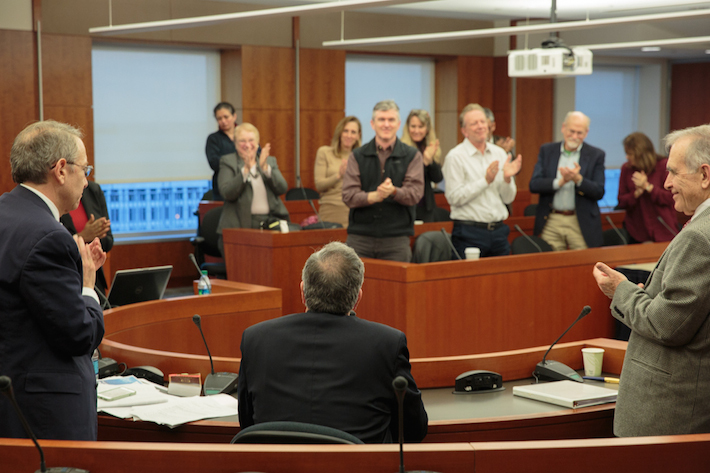 He also recognized Provost Steven Lerman, who will step down from his post at the end of the calendar year. “I want to join everyone in thanking him,” Dr. Knapp said, leading the room in a standing ovation. A reception in Dr. Lerman’s honor was held immediately following the meeting.